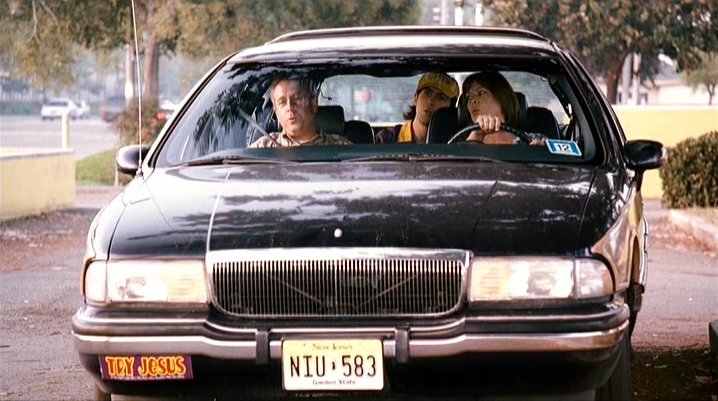 IMCDb.org: 1991 Buick Roadmaster Estate Wagon in "Clerks II, 2006"
1996 Buick Roadmaster Estate Wagon. Could be also 1993 through 1995 (we have two of them, both from 1994). They all look the same, despite optional wheels and wheel covers. Any one for such a car? Today I saw such a 1991 Buick Roadmaster in the second next town - abandoned without plates, totally dusty and already with the big orange sticker of the municipal office on the window "Away with it within the next days or we will confiscate and crush it"
That's a 5 Liter engine minimum, so no thanks. The owner probably had to choose between the Buick or feed his children. @Nightrider: dusty. I haven't seen rust, but I've just spotted it while driving. Love the dark color contrasted with the wood tone. ingo wrote Any one for such a car? Today I saw such a 1991 Buick Roadmaster in the second next town - abandoned without plates, totally dusty and already with the big orange sticker of the municipal office on the window "Away with it within the next days or we will confiscate and crush it"
@rtsbusman1997: not now, but I'll take the camera with me the next time, when I drive to my office. It's just besides that way. But it's not really abandoned, as it seems. On the other side of the street is a garage, which also deals with US-cars, as their sign says. And in front of the owner's house parks an El Camino. So I would say, they have parked it outside (illegally without valid plates) due the lack of space. But they should be careful, as the red municipal sticker is from the 2.February, so since two weeks. It says, that the car has to be removed "unhesitating", without a fixed timeframe. This timeframe variies between the towns. Sometimes the authority ignore it for weeks, somewhere else the owner get get in trouble after two, three days. Nice catch. I'd guess that the car is part of the US cars dealer garage. It's too clean and preserved. Actually, the one you've seen is specifically a 1995-96 model, you can tell by the mirrors. @rtsbusman1997: it's not really clean. Not good to see with this colour, but it's indeed very dusty and it seems to be wet inside, by the haze on the windows. There's also some junk inside. @Lateef: I'm not familar with such details of US cars And this is a very rare sight over here, actually I cannot remember, that I've seen any with German plates before, only a very few with Dutch (@G-Mann: yes, from the much smaller country, with the smaller streets, the smaller parking lots and the smaller garages ) and Swiss plates. @ingo : The haze looks like condensation. The car did look a bit ruffled up, but when I said clean, I was surprised that it was pretty together. I expected a rolling wreck. ingo wrote But it's not really abandoned, as it seems. On the other side of the street is a garage, which also deals with US-cars, as their sign says. And in front of the owner's house parks an El Camino. So I would say, they have parked it outside (illegally without valid plates) due the lack of space. More likely a customer of theirs that abandoned it. It could be a absence of space. Auto shops do that all the time around here in Brooklyn. rtsbusman1997 wrote @ingo : The haze looks like condensation. The car did look a bit ruffled up, but when I said clean, I was surprised that it was pretty together. I expected a rolling wreck. Shall I bring it with me in May, when my wife and me will make a trip to rtsbusman1997-town? Everything else you said seems accurate. Might have been a mid year change OR maybe one set was exclusive to the V8 models? Maybe in 1994 GM sold both the V6 & V8 models together? I would have to see the 1994 GM sales brochure to confirm why they sold both wheels. Edit: Well I am an idiot.....They are there....with the center cap (D) in the pictures...ugh: http://www.auto-brochures.com/makes/Buick/Buick_US%20Full%20Line_1994.pdf - here is the 1994 Buick lineup and those wheels ARE there . Also 1994 the V8 was the only offered engine.